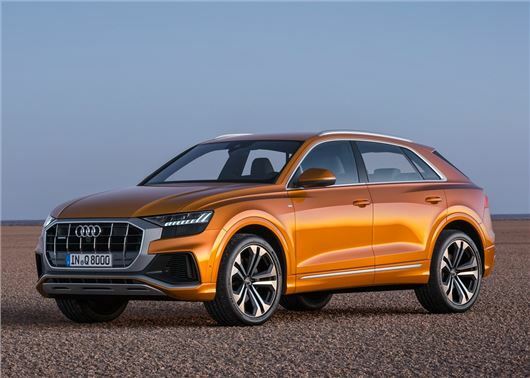 Audi's new Q8 has been revealed in a bid to rival the BMW X6 and Mercedes-Benz GLE in the coupe-slash-SUV segment. Previewed by the Q8 Sport concept last year and revealed in production form at an event in China, Audi says its latest model combines the elegance of a four-door luxury coupe with the versatility of a large SUV. At nearly 5.0-metres long, the Q8 is slightly shorter than the Q7 on which it's based yet 27mm wider. Its coupe-style roofline means it's not quite as practical as the Q7, holding 605 litres of luggage with the rear seats left up (compared to the Q7's 770 litres). While the Q7 is available with seven seats, the Q8 will only come with five. Only one engine will be available at launch - a 3.0-litre turbodiesel producing 286PS and 600Nm of torque. Badged the 50 TDI, the V6 uses Audi's eight-speed tiptronic gearbox, reaches 62mph in 6.3 seconds and a top speed of 144mph. Mild hybrid technology means it can coast at speeds of between 34 and 99mph with the engine switched off, while stop-start kicks in at speeds below 13mph. The Q8 will be exclusively four-wheel-drive, with a mechanical centre differential splitting torque between the front and rear axle at a ratio of 40:60 as standard. When required, it can be shifted to the axle with the most traction. Adaptive air suspension is fitted as standard, letting drivers flick between four drive modes, varying the right height by up to 90mm. Off road, it can boast a maximum ground clearance of 254mm while hill descent control keeps the speed down while dropping down steep slopes. In S Line specification, the Q8 comes with 21-inch alloy wheels, while the top-spec Vorsprung comes with 22-inch alloys. The Vorsprung also comes with all-wheel steering, reducing the turning circle at lower speeds and increasing stability at higher speeds. Prices are yet to be confirmed, but expect them to take a similar approach to the BMW X6 and Mercedes-Benz GLE. As such, it'll be more expensive than the Q7 - with prices expected to start in the region of £65,000 when it goes on sale in the UK in summer 2018.